Finally blogging about the West Coast Trail (henceforth called WCT or WeeeeCT as I said one day) that I hiked back in mid September with two friends. Like I mention in my previous blogpost I had been working out to shed weight and gain stamina/strenght. I managed to hit the 85 kilogram mark around the time of my flight on 14th of September to the States. René, a good friend, picked me up in the very early morning and dropped me of at Schiphol airport. Thanks buddy! Just before my first flight I read about a guy that ran the WCT in 16 hours divided over two days (check his video about it). That's 75 kilometres. I respected that guy straight away but that respect would increase within the week. My flight via Newark,NJ to Seattle,WA went fine. Compared to my flight to Sydney this was short one so that didn't really phase me. However United, the airline, is not in the same league as Garadu Indonesia or Malaysia Airlines. Legroom and food being way better on those airlines and I saw most of the movies that were available via in-flight entertainment but then I tend to see a lot of movies so I'll let that one slide. After landing at Newark I had to waiting 2 hours for my second flight and final destination for the day, Seattle, WA. Navigating from the airport to my hostel wasn't entirely straight forward but that was more my doing. Getting onto the lightrail and heading into the city was the easy part. Here I even met an American couple that were visiting Seattle for the weekend and we talked a bit. Which was my first introduction with Americans on their home turf so to speak and they didn't seem to be like the stereotypical Americans we all know and uhmmm well know. Just before my stop at Westlake station we said our goodbyes as I headed on. Finding the hostel though was rough and I even walked past it but eventually I ended up in my room for the night. It had some wicked wall/ceiling decorations. The hostel was quite good, except for the noise from the street so lesson learn I guess and next time I'll get a room at the back of the building. As I would be waking around 6:00 in the morning to catch the ferry towards Vancouver Island I got a shower and headed out for a quick bite to eat before hitting the hay. It's always great to travel by public transport in a foreign country as you see quite a lot and my preferred method is by train but driving in a car is another great way to see lots. It's amazing how massive Canada is and how beautiful nature can be in a vast country like this. I like The Netherlands but nothing beats the open vastness that is a big country with lots of nature. You don't really have that back home. During the drive you see lots of logging roads and tiny villages. In Port Renfrew we reach our cabin where we would be stay the night. The check-in was the most awkward ever as the people at the counter were the most unfriendly people I ever met and it took ages to check us in. The cabin had a ugly yellow finish on the inside but we started to unpack and divide our supplies nonetheless. Which actually went quite quickly so we head down to the Coast Kitchen,a local restaurant, for fish & chips. It's a family run business that makes everything from scratch and even gets the fish out of their backyard (Atlantic ocean). Especially the tartar sauce was good. After two pitchers of beer Adam and I were a bit tipsy so we all headed for our beds in the cabin, our last indoor night for the next 6 days. Next day was another early rise, this was a necessity because we needed to catch the watertaxi bounded for Bamfield (the north trailhead of the WCT). We met some other hikers that would be travelling with us on the boat and we saw them many a time along the hike too. The watertaxi was one of the highlights of this entire trip. Besides the very friendly and humours captain Brian that even had a notch based system on the amount of camera that died on the watertaxi over the years, the scenery, the animals and his stories about the different parts of the hike made it worth every penny. Although most of the coast was shrouded in morning mist we got to see where we would be hiking in the days to come, obviously in the opposite direction. We met lots of sealions that have made there home on the rocks along the way but then we see or rather hear the spray of a grey whale. And even though we don't see any whaletail (no phun intended) we get to see this beautiful creature close up swimming along side the watertaxi. So close in fact that counting the barnacles on him or her is easy. Day 1 (Saturday): Pachena Trailhad to Camp Michigan Distance: 12 KM / Time: 6 hours approx. Bamfield is a nice little village that seems to have done quite well. Mostly fishermen and other sea related workers here but its cabins along the coastline look very nice. After getting a snack we take a taxi to the trailhead at Pachena Bay. Here we have to wait for the mandatory orientation, thus we sit on our asses for 3,5 hours. A total waste of daylight but we take the time to explore the nearby bay. Adam shows me beachglass he finds here. I've never heard about this phenomenon before but apparently old blue medicine bottles, green/brown alcohol bottles and even transparent bottles get sanded down by the ocean into small pebbles that look pretty neat. Adam ends up with two handfuls of the stuff. I head back to repack my backpack and put on my runningshorts as the weather is around 30 degrees Celsius and sunny that seems like a good idea. Before we headed for the beach we got our hiking permits and map. It's a big let down that the hiking permit doesn't include the mandatory ferry rides that we take along the hike. The orientation seems to be a repeat of what I already read in Blisters and Bliss (a must have guide to WCT hiking) and other website on dealing with wildlife but also includes areas where wildlife like cougars (no...not those), bears and wolves are active at the moment, the only helpful part about the orientation. The first day on the WCT is tough going through the rainforest (not like the Amazon but a pine rainforest), due to high tide we couldn't use the beach access, so it was roots, mud and ladders. Although lots of people dislike the ladders as a method of ascending or descending we really like them and prefer them then going up & down on roots/mud and the sort through the rainforest. The upkeep on the ladders is also way better then the boardwalk which is graded from very bad to non-existing in most places along the hike through the forested areas. After about 10 K in we have our first real break at the Pachena Lighthouse. Along the WCT there are several lighthouses that are maintained by families whom live there year round. Supplies get shipped in and attached to a cable (zipline) near the lighthouse and then pulled in by a diesel motor. We crave some food and eat some of our dried fruit and meat while drinking water mixed with kool-aid. Along the hike we used aquamarine tables to treat the water for any bacteria; this however gives the water a distinct chlorine taste so the kool-aid was an idea to mask that but I prefer the chlorine taste to the kool-aid ;) Next hike I might use a waterfilter instead, even though they are way heavier then just tablets but the taste will be a lot better. A little trick I did find out myself is that if you need some extra energy it's worth adding ORS (Oral Rehydration Salts) to your water. Normally used to treat dehydration associated with diarrhea and the like but it's a great way to get some salts and sugars in you will drinking. So bringing this stuff is multi-purpose which is what I always look for in hiking gear. Setting out again we reach our first camp for the night after only 2 kilometres walking, Michigan is a nice campsite with a steady supply of fresh water. It's namesake sunk in 1893 and left the boiler behind on the rocks. We soon start putting up our tents and I try and fail to make a campfire. It's quite a difficult thing to do even with all the stuff I brought with me. I move from the basic firestarter to my lighter but after 20 minutes I ask Adam to help out. Certainly something I need to practice. Our fire for the night is quite small due to the wetness and tiny amount of fire wood in the vicinity. But thankfully we use this only to stay warm, to cook we have a gasburner. Our first evening meal consists of instant macaroni & cheese. Basicly you add boiling water to a pack and wait. Not very good but it's food nonetheless. The night is upon us before we know but the small campfire makes for a good companion besides Chrissy & Adam of course. Time for bed and sleeping isn't a problem with the Atlantic Ocean gently crashing it's waves nearby. Day 2 (Saturday): Camp Michigan to Tsusiat Falls Distance: 13 KM / Time: 6 hours approx. Half past 7 we start our day early to use all the daylight we have. The rhythm on a hike is mostly set by the sunlight, something you loose sight of during normal life but is actually quite easy to get use to. And that's saying something coming from me. We have 13 K to go today so we eat our instant oatmeal which is very good to be honest and refill our water canisters. I'm really loving my camelbak which hold about 2 to 3 litres worth. You do notice the weight in your backpack and it's not easy to judge the amount left but the water temperature remains cool throughout the day. It's mostly a beach walk today and due to the amazing weather this is very hard on us. Later we learn that we hiked in the driest period ever recorded on the WCT. Besides the blazing sun we have to deal with the beaches that isn't nicely compacted sand but also small pebbles that your feet just sink into and that draining your energy. Even though we do have a short forest walk this isn't much easier then the beach. Adam is in charge of moral support and keeps the bears away with profanities. It seems to work, as we don't encounter any during the entire hike, well kinda anyway. Animal tracks however are abundant on the beach; you can easly see tracks left behind my various animals, sometimes even with claws so possibly cougars. Other tracks come in form of poo. You see a lot of poo in the forest that is saturated by blueberries. We eventually reach the anchor of the Woodside ship that ran a shore in 1888. We take the time to resupply our water and have a snack but I also end up changing my socks. As my hiking shoes seem to be a bit of a let down waterproof wise. I end up leaving them in Victoria. However my new gaiters work very well. Especially on the beach they are great for keeping out the sand. Our cablecar ride over the Klanawa River is quite nice even though you need to pull yourself in when you reach the halfway mark it's fun ride (see video one & two). The remainder of the day we push on through the forest and see some amazing scenery along the way through a clearing near the cliffs that surround the beaches. Upon reaching the cliffs near the camp we climb down the longest set of ladders we have yet encountered. We set up our tents while enjoying the view and the sight & sound of the grey whales looking for food in the nearby shallows of the sea. Very cool to hear them spray when they surface to exhale and breath in again to submerge. The nearby waterfalls make for a great shower although a cold one. It's wise to get the drinkwater from the waterfall itself here due to washing up and the sort. This time we find lots of driftwood that is very dry and makes for excellent firewood. Our campfire this night is very nice and we eat lasagne with parmesan cheese which makes it ten times better. Eventually we start packing our food away and I volunteer to bring it to the bearbins. Although I brought rope and a waterproof bag to hang it in the trees, the bearbins are a lot easier. Basicly they are made of solid steel with a carabiner to lock it. Normally they are very accessible near the other camp facilities like the self composting toilets. However this trip takes me through the beach, across a stream of water, which I didn't see so end up with wet shoes and socks, over fallen trees that have been washed a shore and eventually make me climb to the bearbins. Quite an ordeal but at least our food is safe from bears. But there our other critters out tonight that are looking for easy way to get food. We hear some girls screaming and end up seeing the tiny cause. Mice seem to like hikers or rather the stead food supply they bring. Adam & Chrissy go to bed early as we agreed to head out at first light. I stay near the fire to dry my shoes & socks while writing in my journal. Day 3 (Saturday): Tsusiat Falls to Cribs Creek Distance: 16 KM / Time: 7 hours approx. We quickly rise today and after getting watered and fed we are off. On this misty day we make great time along the beach with compacted sand beneath our shoes. Our first sight is the hole in the wall, something that was easy to distinguish when we were on the watertaxi. We use Adam's speakers plus their iPod for some tunes to keep up moral. It really works! I also have to adjust my opinion about hiking poles. They seem to be really handy here and even though I only use one and it's a Gandalf like walking stick I really like having it around. It helps a lot when you need to steady yourself but also on the beach it helps to use your hands to propel yourself forward with something besides your leg muscles. Still find it weird that people in The Netherlands use hiking poles though, it's flat for pete sake. Pity we have to leave the beach so soon and head inwards along the cliffs in the forest. We reach our first river crossing by boat at Nitinat Narrows where you can also buy a great meal. Albeit not the cheapest but then the freshly caught salmon from the river we just crossed is delicious. Chrissy & I even buy a soda. Ahhh taste of sugar is a blessing. We start hiking again and after a very swampy area where we also meet some other Europeans (I even speak some Dutch with a German) along the way we reach the most beautiful parts of the track. Just after Cheewhat River on kilometre marker 37 we take in a very nice forest with a very broad path. It's exactly like Blister & Bliss book say it is. Cribs Creek isn't far off now and we soon reach it. Setting up camp has become a well established routine now and everybody has there own job to do. We enjoy real spaghetti with tomato sauce and some more parmesan. Feast for kings! Here we also meet some other hikers like two Swiss people (only remember his name, Thomas) but also to other Canadians that we also met back in Port Renfrew near our cabin. We share the campfire that's burning the end of a big dead tree. Adam and I offered to share our Whiskey and Jagermeister with everybody but end up drinking it ourselves, nobody seems to want a little pick me up. We swap stories around the campfire and then it's time for bed. Day 4 (Saturday): Cribs Creek to Cullite Cove Distance: 17 KM / Time: 8 hours approx. Today Adam is a bit weary from the booze last night but I'm happy that I remembered to drink plenty of water before sleeping. We start walking the beach as soon as we pack away our tents and eat some oats. Today is a 17 K hike, the longest yet. We reach the second lighthouse on the trail, Carmanah Lighthouse, quite soon after leaving camp. Chez Monique is just around the corner here and we can't wait to eat some real food again. Chez Monique is a makeshift restaurant on the beach run by two friendly women. Besides getting a proper meal (I get myself a hamburger) you can also buy stuff like brownies, gummy bears and other goodies. There is also a free food bin where you can leave food you won't be needing anymore and take stuff you want. Along the way of over the beach we spot a helmet that could have been debris from the Japanese tsunami. The rest of the beach walk is tough going with little pebbles. We soon opt for the forest route that isn't much faster but at least shades us from the sun. We reach Cullite Cove just 45 minutes before the sunset and quickly start setting up camp. Instead of camping on the beach, which is impossible here due to the large rocks in this cove, we camp just near the edge of the forest. This was my favourite campsite but that is in part because my tent pegs stay put in the solid earth. On the beach this wasn't the case and I needed rocks to secure them (I recently bought some new pegs that are especially designed for beach and snow). Another reason why I appreciated this nice little cove was that there was just one other hiker to share the camp with as most other campsite are quite busy during our week. He is from Austria and has been riding a motorcycle from South-America for a long while to get to Canada. Quite an amazing story and we sit around the campfire while we eat our remaining spaghetti & some camper instant meal we got at Chez Monique while listening to the stories about his trip from South to North America. Day 5 (Saturday): Cullite Cove to Thrasher Cove Distance: 13 KM / Time: 8 hours approx. Our last full day on the trail and we got 12 K to go, little did we know that these are the hardest 12 we would do. We also count the longest set of ladders with a total of 234 rungs. Due to the path going through the forest, most of the bridges being logs is stead of proper bridges and the mud & roots it is slooooooow going. Chrissy especially dislikes the logs but she has good reason to as she broke her foot not so long ago and it's acting up as we wind our way through the forest. We soon reach a camp where we aren't camping but take a long needed rest while eating noodles, brownies and other delights. Damn those brownies were good! Adam encounters bears here! Along our way to Thrasher we see several hikers heading the opposite direction looking very upbeat and fresh. There only two days into the hike so it's understandable. The last kilometre to camp is very though as it's down hill and hard to navigate without any indication how to walk. It doesn't help that this kilometre is a split off from the main route and we will have to do this part again tomorrow. 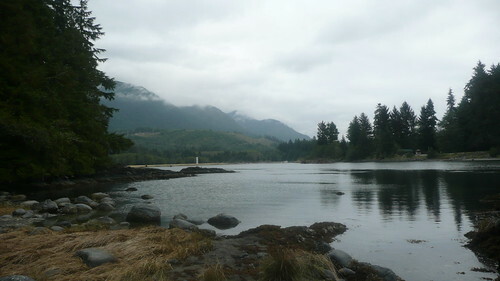 Thrasher Cove looks out over the bay towards our finally destination, Port Renfrew. We set up our tents and eat food quickly before going to bed as we are all tired from today's walk. 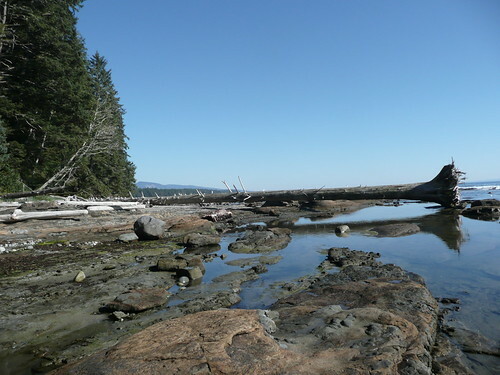 Day 6 (Saturday): Thrasher Cove to Port Renfrew Distance: 6 KM / Time: 6 hours approx. For the last 5 K (not counting the back tracking we did for the first kilometre) the book tells us it will take 5 hours and that's spot on. This part of the hike also meanings going over the highest point on the route but is certainly a very nice area of the WCT. With very open areas with lots of pine trees. We also reach the second donkey engine here and know that the track goes mostly downhill from here on in. After some more trekking we encounter a group of 20 school children + teachers & parents which makes us glad we didn't have to carry that responsibility along with our gear during the hike. The 75 kilometre marker isn't far off now and we get to sit a while on the beach waiting for the ferry to take us across the mouth of Gordon River. We sign out at the Park Canada hut and Chrissy and I wait while Adam gets the car. He actually ran the 5 K to the carpark. Bikkel! Our hike is done but we have two more days of relaxing with some nice beers and good food in Victoria before I have to say goodbye again and head back to Seattle with the ferry. I especially enjoyed the Innis & Gunns beer but also like Kilkenny. Thanks for the tip Adam! The West Coast Trail is a good hike, it certainly could use some upkeep on the boardwalk but I bet their main concern is bridges and especially the very necessary ladders along the route. Sure it's not as diverse as my first hike, Overland Track in Tasmania, but hiking along the beach and through the forest has it's charm. I hated that the ferries prices that are mandatory weren't included in the park fee but that's the only thing I really disliked about the hike. Sure it's tough going in some parts but you kinda forget about that part after a while, especially when you get to share a meal with friends around a warm campfire while you hear the ocean roar and the whales surfacing in the distance. If you ever do this hike get into shape, buy hiking poles, use gaiters and enjoy! Thanks to Adam & Chrissy for sharing a week worth of scenery and hiking, I hope to see you guys soon. Some more pictures here. I'm already planning my next hike but it's in early stages so more on that soon. My next blogpost will either feature ATM skimming or couchsurfing which I did during my city trips in Seattle & New York (and soon London).